Our House with the 2 B&B rooms is situated in the district of Auriac, South Carcassonne. We offer one suite (2 rooms) on the ground floor which is accessible for wheelchair users and a deluxe room with jacuzzi and shower on a lower floor. 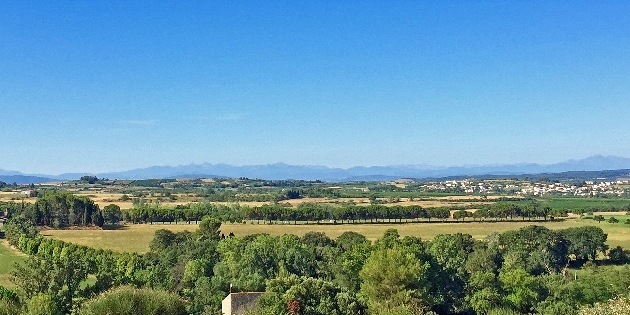 The terrace where we serve breakfast is overlooking the Pyrenees and the Golf Course of Carcassonne. Hertz, Europcar etc. are directly at the airport. It is 9.3 kilometers or 12 minutes to our house in Cazilhac. Auriac is situated on the south side of Carcassonne. From the airport exit turn left towards Carcassonne (D6161) and follow the blue motorway signs towards the motorway A61 (Toulouse and Narbonne). On the first roundabout take the 3rd exit towards the Hospital and Narbonne (D6161) At the traffic lights turn left (D118) and turn right on the next roundabout (D342). Follow this route until you pass the Carcassonne Golf course on your right. Take the next exit towards Auriac and "Institut de Technologie and Institut de Soins Infirmiers". Follow this road up the hill and cross the roundabout. Number 12, Chemin de Maragon is on the right. Take the motorway A61 from Toulouse and leave the motorway at Carcassonne Ouest Exit. After the toll road go towards the roundabout, second exit and follow the signs towards the Hospital and Narbonne (D6161). At the traffic lights take the left towards the next roundabout (D118) and take the first exit to the right (D342). Continue on that road and you will pass the Carcassonne Golf course on the right side. Take the next exit towards Auriac and the "Institut de Technologie et Institut de Soins Infirmiers". Follow the road uphill and cross the roundabout. Number12, Chemin de Maragon is on the right. After the toll road follow the signs towards Carcassonne (D6113). Take the first exit on the right towards Zône Industrielle/Montlegun/Lac de Cavayère. At the roundabout take the third exit towards Limoux (D6161/D342) and follow this road until you reach another large roundabout. Here go straight on toward Limoux (D6161/D342) and you will drive over the Motorway A61 again. Take the next exit left towards Auriac and the "Institut de Technologie et Institut de Soins Infirmiers". Follow the road uphill and cross the roundabout. Number 12, Chemin de Maragon is on the right.